Old timers here in Muscat may remember that Feeney's used to be in a different location than where it has been in recent years (recently it was found in Shatti just off the beach). It's moved to its old location, the Beach Bay Hotel - it's moved back to where it started, albeit into an expanded space than where it was. 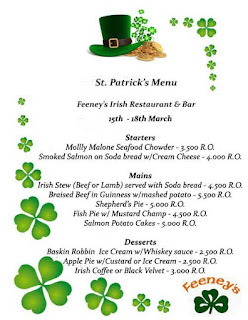 Conveniently, they're open just in time for St Patricks day... and they're offering a special menu for that all week too, so if you are looking for somewhere "new" to go, then why not check them out?